Sports Interactive and SEGA have revealed that Football Manager 2019 Touch has just launched on Nintendo Switch in Europe, Asia, Australia and New Zealand. North American fans will get the game slightly later on 6th December. 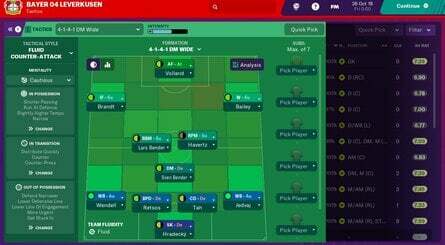 The Football Manager franchise made its debut on Switch earlier this year with Football Manager Touch 2018 (despite its flaws, we couldn't help but feel it was still a good choice for Switch-exclusive footie fans) but this new title is said to bring "improvements and enhancements across the board". We have a lovely list of features and screenshots for you to check out below. - TACTICAL STYLES: Take a ready-made path to success with new, off-the-shelf tactical pre-sets including ‘Gegenpress’, ‘Tiki-Taka’ and ‘Catenaccio’. 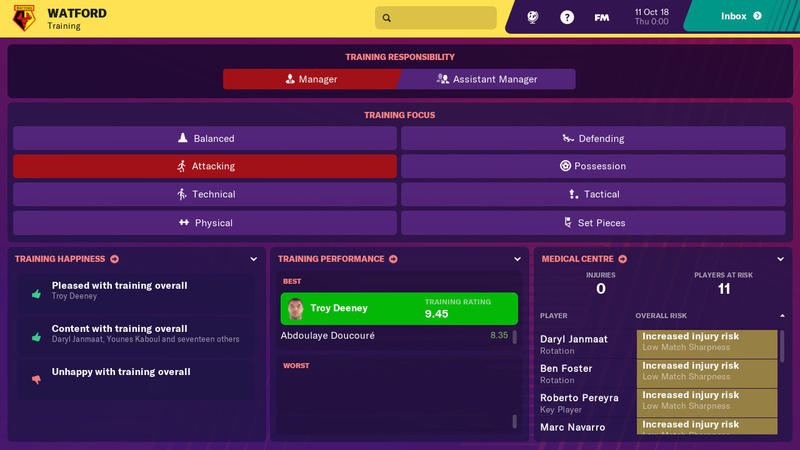 - TRAINING REVAMP: The revamped training module is not only fresh andsimplified, but is also a realistic representation of how clubs develop younger players and prepare the first-team for individual fixtures and the season ahead. - NEW MANAGER INDUCTIONS: Kick start your managerial career with a primer on the management fundamentals, designed to guide and elevate new managers towards success. - REFRESHED USER INTERFACE: A fresh lick of paint and a host of small, but meaningful changes ensure that FM19 Touch is the best-looking version of the game ever made. - WILLKOMMEN BUNDESLIGA: The top two divisions of German football make their debut in Football Manager 2019 Touch, which means that both the Bundesliga and Bundesliga 2 feature official club badges, kits and player faces as well as their respective trophies. The game is now live on the eShop, available for £29.99. Are you a fan of the beautiful game? Will you be tucking into Football Manager's tactical delights today? Let us know in the comments. Oh a "soccer" game. Pass. I'm still good with 18 for a while. Created my own club in League 2 and took it to Championship. Working on Premier League advancment now and again in between other games. It's s sports game. Other than a graphical makeover it's the same game over and over again. I find these to be extremely boring yawnfests. For $54.99, I'm gonna say no thank you. I love FM but I’ll stick with the full game on Steam. Hartlepool are going to Wembley! If this has all it's UI issues sorted I'll be purchasing immediately. 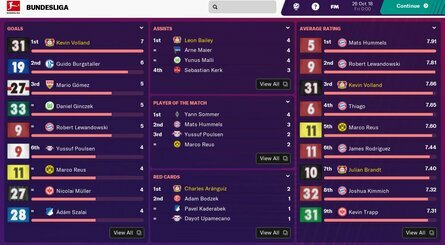 I haven't played FM properly since I was a student 10+ years ago, and I don't have time for the super in depth direction it has gone recently. To be honest I just wanna buy wonderkids from 3rd division Brazilian sides for a pittance, play 4-4-2, and take Accy Stanley to the premier league title. No one here cares what you think. @BenAV It's lucky that this will be £29.99/$39.99 then? You think anyone else on this site gives a rats tail what you think either? What’s annoying is that in less than a few months, if we want to get the improved game, it’s another 40 quid! If they were going to release this now, surely they could have offered a discount to those who bought it earlier this year? @Skunkfish I'm talking about Australian dollars, considering I live in Australia. Of course not, but I also dont see an article headline for a game being released in a genre I don't like then click on the link to the article and act surprised in the comments section with lines like "Oh a "soccer" game. Pass". So I have that going for me! Decent, I'm glad they've supported the Switch. Always though a basic port would have been good on DS or Wii, so I'm pleased they've continued releasing them on the Switch. @ferryb001 Articles will always list pricing when we have it - in this case, at the time of writing, the pricing wasn't available. We've updated the article now. I just want to be able to select default Opposition Instructions so that I don't have to manually set them up at the start of every single match...and I'd be willing to pay £30 for the privilege! The improvements and new features for FM19 Touch certainly look nice! 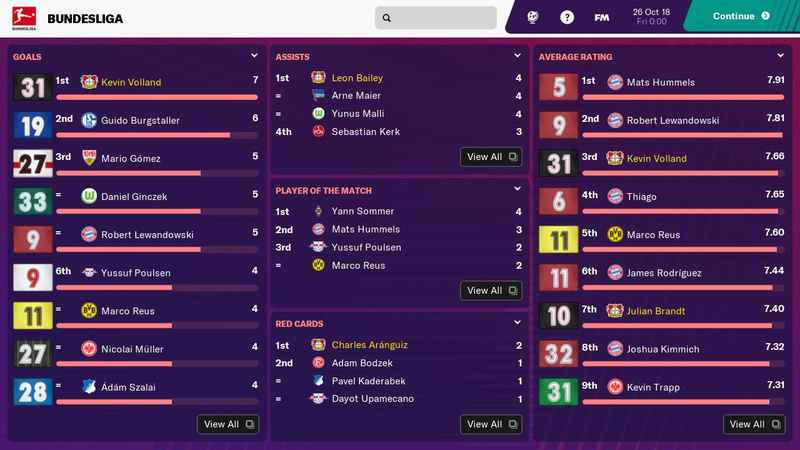 The tactics and training systems seem much improved - and it's especially great to see the Bundesliga (and 2.Bundesliga) officially licenced in the game! ..if the Opposition Instructions can be pre-set, I'll probably give this a download this evening! @AlexOlney Are you talking about that lmao missed goal? @AlexOlney awight 'arry fing is with Wenger he always tries to walk it in. @SBandy aye some people are just that way. They watch some anime and they think it makes them to cultured for the likes of a football game. I thought that Kill la Kill announced on the weekend looked awful and generic but you didn't see me attention seeking in the first comment. @NaviAndMii I'm not too well informed on this version. Is there a good reason it's cheaper on the Google Play store? Are there many differences that you know of between that and the Switch version? @gcunit Quite different versions. This is the tablet version that's not available on the play store from your phone. @gcunit the one you are looking at is football manager mobile. It's not like FM touch. Touch is a stripped down version of the fall fat PC game. I was very dissapointed with the Touch version of the game. If you think you're getting something like the PC version, you better not get this. @GameOtaku Oh, a "comment". PASS. @kobashi100 @jsty3105 Thanks for your input, but I was talking about FM Touch not Mobile. I know the mobile version is different. The Mobile version costs £8.99. The Touch version on Google Play costs £19.99. The Touch version on Switch costs £29.99. Why is the Switch version £10 more expensive? I know there's a custom control scheme, but is there anything else, or is it just Switch tax? @eltomo Can you elaborate? What were your main disappointments? @gcunit It is the same price on Steam so no Switch tax here. I'm not sure if the Switch and Steam versions are the same but if they are then there are functionality/feature differences versus the tablet versions. 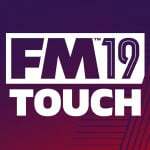 FM2019 Touch on Steam is £21.99. £21.99 and £29.99 is not 'the same price'. @gcunit sorry. I looked at US pricing and immediately assumed UK pricing was identical. @GameOtaku Football may be boring for you, it is wonderful for others. Living on this planet you should know by now how it works. Can anyone confirm if the touch controls are any easier/more comfortable than 18. I'm tempted but 18 gave me eye strain and the menus were far to small! @RunninBlue It's a quote from the tv show IT Crowd. @gcunit Yeah - I feel that there may be a little bit of Switch Tax-ery going on I'm afraid! So far, I've seen video's for the latest versions of FM Touch on both Steam and iOS - the versions are all very similar - but the Steam version seems have a couple of extra QoL features which give you ever-so-slightly more control over your team, has additional 'cross-save' functionality (with PC) plus an extra 'Versus' mode as well...so that one seems to be the most fully-featured package for the Touch version of the game - yet is cheaper than the Switch release! I will say that, once I got used to it, the controller functionality made navigating menu's a breeze in FM18 Touch - I ended up barely using the touchscreen at all (despite mainly playing in Handheld mode) which is a credit to how well they were implemented...not sure it was worth paying a few pounds extra for, but it is a nice addition which I don't think is available in the Steam/iOS versions - and there was some intangible feeling having last years' game on Switch which just 'felt right' somehow! What is the text like on Handheld? It looks very small in the screenshots - my eyesight ain't the best these days. Doom was spoiled for me because I could barely read what was on screen. Wish we could get Out of the Park Baseball on the Switch. That's by far my favorite sports simulation, and I'm not even a big fan of baseball. @AlexOlney What was Wenger thinking, sending Walcott on that early? 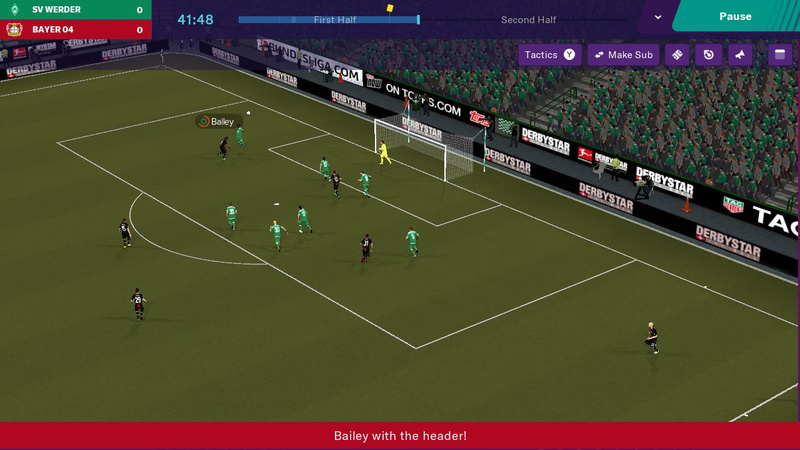 I'll stick with FM19 on PC for now though, sadly the PC version of the game is still vastly superior. Did you know the creators of Out of the Park actually learned their craft (yes, the series existed before, but wasn't on the same level) from Sports Interactive - the FM creators - while they were part of SI? As a FM player, it becomes immediately obvious when I first saw a friend play OOTP. There are lots of similarities. So maybe you should check out FM instead. @Tullochard The text was fine and readable in FMT18. Besides, just like in any FM game, you can scale the UI to your liking. I hope one day Sega, Playsport Games and Nintendo release Motorsport manager. I love that game. @fnlnkn The thing about Arsenal is, they always try and walk the ball in. @shani "So maybe you should check out FM instead." While I'm not a big baseball fan, I like it better than soccer. That's right, I called it soccer! Oh so if I don't like something I should just keep quiet huh? That's not stopped others from carpet bombing games I enjoy and the only reason they gave was "well I just don't like it" and they weren't spoken out against. So what's the difference, look at the dismal review Reflexions got and the remarks posted on when the game was announced and tell me that I'm in the wrong for saying this games a pass based on my personal prejudice. @GameOtaku I am happy that all we NintendoLife readers made you understand that football video games are liked by many people around the world. So you don't like it when people do it to games you like so you do it to games you don't like. You are a hypocrite and a saddo. Sounds like the hypocrite is you. I gave my honest opinion just like others have . So you don't agree with me. Big whoop de do. Does any know if the user interface been updated?. I love fm2018 on switch. Infact still playing it. But i would love a simplier user interface. Explain how I am a hypocrite. Do you not give your opinion on this site? Do you expect everyone to agree with you? My opinion is just as valid as anyone else's, some have been positive, some negative. So why am I the only one being dogpiled on for having a difference of opinion? You can have a difference of opinion, but why did you go out of your way to click on an article about a game you had no interest in and dismiss it out of hand and declare all sports games extremely boring yawnfests? You were saying you don't like it when others do it to games you like so maybe practice what you preach. I have nothing else to say on this matter. Have a good one. @GameOtaku you are more than welcome to have an opinion just don't need to be such a p**** about it.